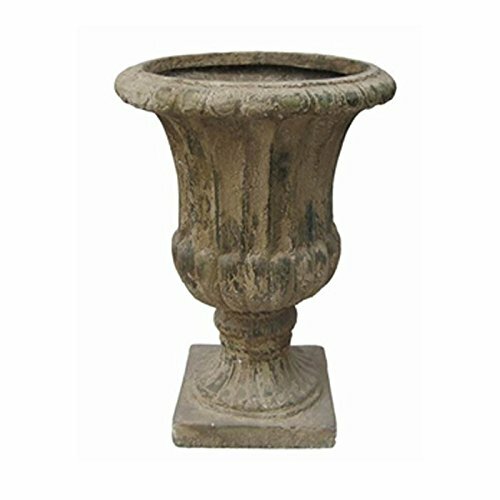 Large Magnesium-Cement Indoor/Outdoor Garden Urn (Pack of 4) by Zaer Ltd. at Tulips Orchids. Hurry! Limited time offer. Offer valid only while supplies last. This beautiful garden urn makes a statement both indoors and outdoors. It adds dimension to your collection, standing out, simple but very elegantly. This beautiful garden urn makes a statement both indoors and outdoors. It adds dimension to your collection, standing out, simple but very elegantly. This planter is lightweight, yet durable, making it easier for you to show it off in any location, year round. It is made out of magnesium cement, which is formulated to add significant strength compared to normal ceramic or terra-cotta, and remains light weight compared to normal cement. If you have any questions about this product by Zaer Ltd., contact us by completing and submitting the form below. If you are looking for a specif part number, please include it with your message.